Progress continues on Jemima. I finished knitting and blocking the front. It looks the same as the back, so I didn't bother to take any photos. Yesterday, while we sat around waiting for the electricians to fix the power in the bathroom, I managed to knit about half of a sleeve only to discover that I'd somehow knit the wrong way on one row. I must have put it down mid-row or something and forgot if I was knitting or purling. Interestingly, I only realized it from the one weird stitch. When I frogged it back, one side was two rows longer than the other. It's all better now, and there's still a chance I could finish Jemima before I head off next weekend. 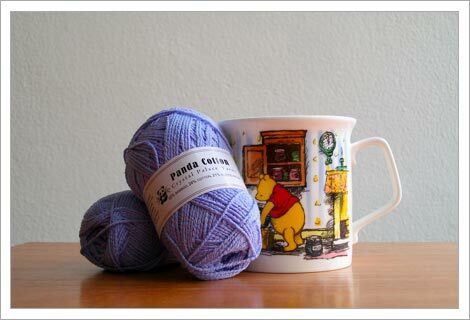 Late last week, I finally received the Panda Cotton I ordered for my mom's socks. They ran out of the powder blue color (my mom's favorite), so I opted for the periwinkle. As Heather mentioned a while back, these are teeny balls of yarn. I'm skeptical that I'l get a pair of socks out of them. I cast on on Friday thinking I'd follow the Laburnum pattern (see the 4 stitch patterns) from Sensational Knitted Socks, only to discover that it's this close to impossible to k3tog in cotton. It can be done, but it slows the flow of knitting down so much as to not be enjoyable. Plus, I don't think the pattern and the yarn, which is a bit splitty, went well together. 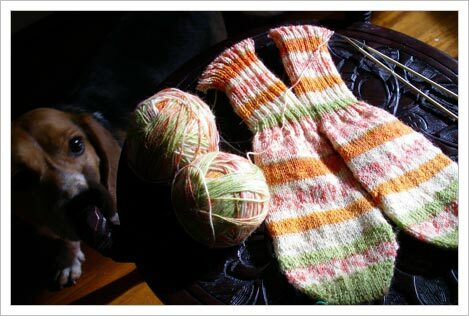 I frogged it after one pattern repeat, and am looking around for something else. I'm not going to cast on again until Thursday when Summer of Socks 2007 begins. The Berlaine also turned up. Unfortunately, it's as I feared: itchy scratchy. No wonder Frenchie turned up her nose up at the mention of 100% wool yarn. This is old school wool - more torture than luxury. 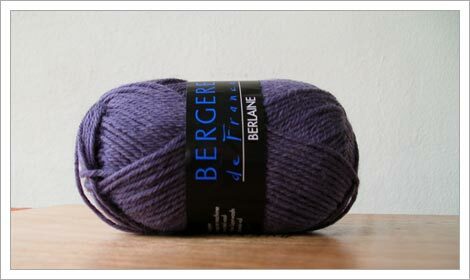 I'm going to wash a few swatches to see if it softens up, but at the moment things aren't looking good for the Cabled V.
I mentioned in passing the other day that I'm going to Berlin next weekend. I'm enrolled in a week-long yoga teacher training course with Manju Jois. For those of you who practice Ashtanga yoga, you'll recognize the name. Manju is the son of Sri Pattabhi Jois, the famous Indian yogi that developed the Ashtanga series of yoga postures. I don't exclusively practice Ashtanga yoga, but I do enjoy it. And, this is a great opportunity for me to work with an Indian master, of which there are surprisingly few. For those who are curious, I teach an interdisciplinary style of yoga with a slight preference for vinyasa flow. That is to say, that I teach a little bit of everything, but I like to keep things moving in the class. I don't believe that one size fits all, and I think there's a lot to learn and take away from all kinds of yoga. However, there are two "foundational" styles, and Jois' Ashtanga is one of them. This is me getting back to the basics. I'm really, really, really excited about this class. I'm also really, really, really keen to go to Berlin. It's meant to be one of the most dynamic cities in Europe, and also home to this little guy. Not to worry, I believe the apartment I rented has wireless Internet, so I will be blogging. There will also be knitting. And yarn shopping. So, OK I've been back from Costa Rica for almost a week. Unfortunately, I returned to the pressure of not one, but two freelance deadlines stacked on top of each other. Still, I have so much to tell you. In four words, the trip was: Exactly What I Needed. This was the view from my mat for two hours each morning and afternoon. I do not want to work in an office ever again. 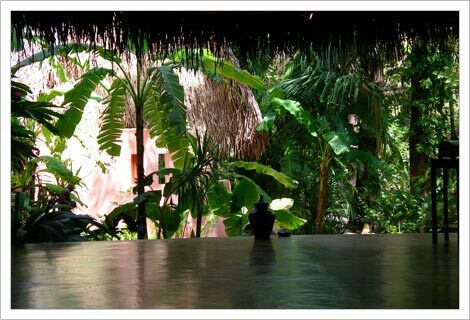 In Costa Rica, I was inspired by the power of yoga to heal, something I knew academically as a yoga teacher but not experientially. I arrived a broken and disgruntled person after a rough year and a half in Holland. The stress has manifested in my body the kinds of aches and pains usually reserved for people at least 10-15 years older than me including: digestive issues and heart burn, a near constant pain in my left hip, a weird knot under my left shoulder blade, and lower back pain that surfaces after shockingly short amounts of time walking around in decent shoes. After just one day in Costa Rica I was literally glowing. Everyone said so. I was naturally smiling, not forcing it. When I saw myself in the mirror that first night, I didn't recognize myself. Seriously. I looked at least 5 years younger and happy. I was happy. I was doing what I really wanted to do. I was particularly inspired by the massage therapist, an older Japanese American guy named Kenny. After a session with Kenny, people were so blissed out that we took to saying that someone had been Kenneyed. I would do anything to help someone feel even half as good as I did. Get your mind out of the gutter! I want to make a difference, but by now I know I'm not going to be one of those people that changes the world in a grandiose way. But I can help one person at a time feel better. When we return to DC later this year, I've decided to have a go at teaching yoga as my primary profession. I'm changing course. No more DC rat race. No more fighting to be taken seriously as a woman in a predominantly male profession. This is good. Astute readers will notice that I now have two socks on one circular needle as opposed to the single sock I was originally working on. The night before I left, I misunderstood a set of directions detailing the short-row heel technique, and I knit myself an irreparable mess. My stitch count was way off. When I studied the sock it became clear that my problems started well before the heel. So I ripped it all out and started over on the plane, much to the astonishment of the man sitting next to me. He marveled through the whole flight about how impossibly small my yarn and needles are. At least I got to cast on both socks and fix the funky toe. Things went OK at first. I knit by the pool, hopping from deck chair to deck chair to keep from frying in the sun. I knit in shade of the open-air restaurant. I knit in bed at night while I caught up on American TV piped in over satellite. I was a hit with my fellow yogis, who wondered about a person who knits wool socks in the tropics. Funny thing about knitting two socks at once. If you find a problem and you have to unknit, you have to unknit twice as much as you really need to. It was a devastating blow to sock progress when I realized that I'd dropped a stitch a while back, far enough back that I couldn't fix it. I might have been able to figure out a way to pull one sock off the needles if I had stitch holders. Note to self: carry stitch holders wherever you go. It took a surprisingly long time to unknit back to my error, sucking away about two days worth of time that I could have been making progress. I thought for sure I'd finish on the 15 hour journey back to Holland, but unfortunately I fell asleep on the long haul. I managed to finish the heel on the flight, but the cuff is being worked on borrowed time as I finish my freelance projects. Lucky for me, my feet are small and my legs are short. I'm almost finished. They're turning out OK, though a bit wonky. I wasn't planning on blocking my socks, but the uneven stitching is bugging me and the short rows are holey. Next I'll be ironing my pajamas.